Solar FLAT for FULL Disc only - cannot seem to be able to use it - SolarChat! A quick (possibly stupid) question. I a learning and getting better and I normally manage OK to do Flats, but the only problem I have is with applying a FLAT on a FULL Solar disc. It is the 3-4 time I try and the flat it is always 'darkening' surface hugely when I add it in Autostakker [after creating it]. Is there a different method for creating a FLAT for Full Solar Disc? Do you have an example I can see as well? I am going stupid at present. PS I am using a PST + Altair 178M and I am starting to guess I might need some kind of diffuser to spread the incoming light? If you do by "unfocuse" on the disc that will probably not work. - There will be gradients not caused by the cam (which you would neutralize by the flat) but by the surface of the sun getting dimmer to the edge. Think most use artificial flats that can take care of most of the gradients. What are you trying to achieve by doing a flat with this setup? 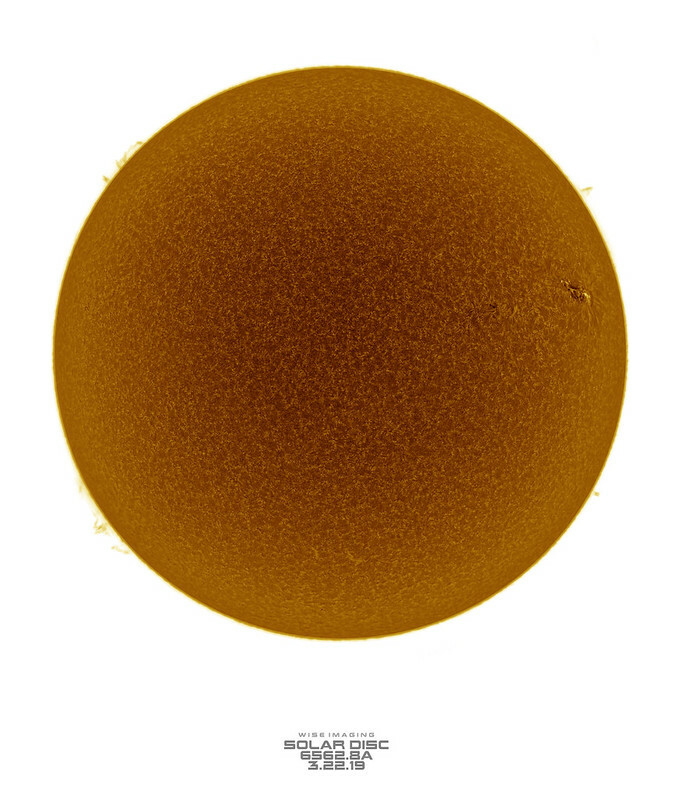 The only sensible way of getting a more even image of a full solar disc is the drift method. During acquisition let the Sun gradually drift across the sensor. Then when you stack in Autostakkert the stacking will remove any anomalies. No need for a flat. I recently was able to successfully do a full FOV disc flat without any special anything. I use a tilt adapter to first eliminate newtonian rings if present. Next, was the real workhorse, a plastic bag. Not just any plastic bag. I've tried plastic bags for years. The key is to find a plastic opaque bag that has a high diffusion property to it. Think studio lighting for photography. I tried grocery bags and stuff. Nothing worked. What did work however was the thick opaque bag found inside a cereal box. I held it up to the sun and instead of just seeing an out of focus ball of light, instead, the whole bag was illuminated because the light scattered and was diffused. This brightens the bag much more and farther along its surface which will cover a small aperture instrument to allow a flat to be made. The transmission is very low. But that's ok! I ultimately was able to do the flat with a cereal bag taped over it (single layer). The key is to match the histogram, the exposure values do not matter here (though less gain is better if you can help it). I did it at 2 seconds (yes, 2 second exposure), 100 gain, no gamma. This produced a 70% histogram fill in my imaging train and that's how I made my flat calibration in FireCapture. Then I simply took off the plastic bag and the gradients were gone and dust was gone. The bag that worked for me was a plastic bag from a generic box of corn flakes! Good find Marty, thanks for sharing! Here's the cereal bag that I use to make flat frames for full and partial discs where the disc doesn't fully illuminate the FOV. I double up the cereal bag so it's extra diffuse. The transmission is very low due to this. But, as long as your histogram is very close to your imaging histogram, it will work. My flat exposure through the bag, targeting around 70% histogram fill, ranges from 2 seconds to 3.5 seconds with whatever gain/gamma you choose. I stack about 20 frames to make the flat in FireCapture (takes about a minute or two). But once it's done, the disc has no gradients, no dust, etc. It works great. Here's the flat calibration frame being made in FireCapture. All I cared about was matching a histogram. It was not even exact, just ballparked it. So here, I'm around 70% histogram filled on the flat. It took 2.4 seconds in this case because I was increasing gamma for contrast purposes (not required). No gain. I took 20 flats so it took about a minute. I do not defocus. The bag does that job. Notice the gradients and dust spots. Also note, the strong vignetting is due to my 0.5x focal reducer on my camera, not due to the bag or aperture. And then I just take the bag off and you have whatever in front of you, dust free, gradient free, wonderfully flat. You can then easily do a full disc or a mosaic without any issues as long as seeing allows. Thank you all for your expert advice - I am learning. I think I might have done it wrongly on that particular learning test. Regarding the full disc, I tried various covers and it seems the one that transmit most light is my 'current' sandwich tub! Got FLATS OK for full disk - finally. Still trying to find a day that is actually 'clear' and not Hazy or cloudy - which I often find it better than hazy! Next step, I need to learn to focus better, then possibly do the Mod stage 2 and make my PST a Quark - but 'without' ruining the original tube. I was wondering how you managed the full disc so easily. I have a 70mm ED refractor at focal length 420 mm (F6 ratio) (Starwave) and a Quark Chromosphere filter. I am only starting imaging a few days ago, managed to get some proms and disc captured using SharpCap (latest version - no gamma control). I am using an ASI120mm-S (I am a complete beginner in solar/planetary) so am getting small views only. What is the secret to get a full disc using a Quark ? Thanks. I saw your incredible video on Youtube, thank you so much ! I wonder if a tilt adaptor might help, as I see some Newtons rings using the ASI120mm-S. But which tilt adaptor would work. I am also using a 1.25 inch right angle diagonal. I think you are using a straight view imaging setup. Why do you block your refractor ? I did not think that would work due to diffraction. I have a 70mm ED. So am I getting more light than you ? Thanks ! Marty. I am going to eat up my cereals as quickly as I can, so I can use it as a diffuser and take good flats !! What type of focal reducer is that ? Where do you put the 0.5x focal reducer in the image train ? On the ASI174mm camera - does it screw into the camera alright ?? Is this right, you said you used 100 gain, I am confused ! I do the full disc with the Quark by using a 0.5x focal reducer (GSO brand, generic, nothing special) on the nose of the camera. Also, I'm using a much larger sensor with an IMX174 chipset, the ZWO ASI174MM. The larger sensor surface area allows a wider field of view. Combine that with the 0.5x focal reducer and a short focal length telescope (400mm in this instance that I used) and I can do full discs with it no problem. But it requires larger sensors, focal reducers and short tubes to achieve it with a Quark with the internal 4.2x telecentric amplifier. I mask apertures to get to a specific focal-ratio range. The goal is to get a focal-ratio that pairs with the 4.2x telecentric amplifier in the Quark to get an end result of approximately F30 going through the etalon in the Quark, as that's where it's optimal to be onband. So I mask my 80mm scope to 60mm to get to F6.67 because F6.67 x 4.2 = F28 which is really close to F30. That's why I masked it. It's not about getting light, there's plenty of light from the sun, it's about getting the right light cone (focal-ratio) for the Quark's etalon to be best. Longer is even better (F40 is even better for example). A tilt adapter helps get rid of newtonian rings. I have a ZWO tilt adapter, it's inexpensive and works. You can also get rid of newtonian rings via post processing, but it's not as easy on a full disc, so I suggest eliminating rings on full disc shots via a tilt adapter. When doing a flat, you do not have to have a specific exposure time, gain, etc. You simply need to match the histogram closely (approximately, not exact). So I fill my histogram to whatever it takes to get it to the same approximate fill in the histogram on both the imaging frame and the flat frame. The flat frame will require a lot longer exposure time, with or without more/less gain, that's up to you, it doesn't matter if you do it at higher gain values either. The key is to match the histogram. So if my histogram when I go to focus and then image is 70% full, when I make my flat, I will adjust exposure values until that histogram is also around 70% full. As long as they're close, the flat calibration will work. You've answered all my questions perfectly! How do you know that you are making the correct size "mask for your telescope" to reduce the aperture to 60mm? Is it simply the hole in the middle of your "front filter" is 60mm in diameter? What material do you use for the front 60mm diameter mask? 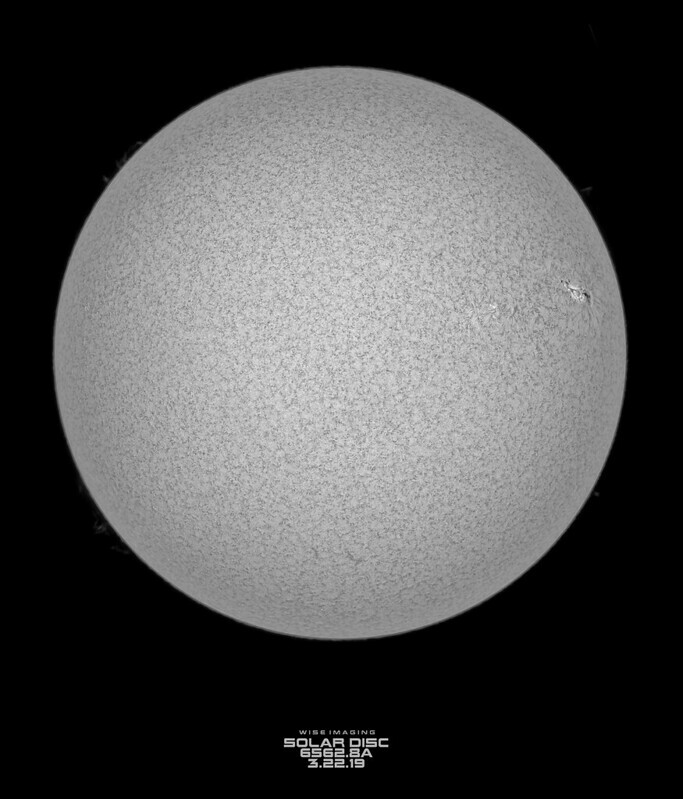 Once I can get more confident in solar imaging, I might get the ASI174mm cool if thats better than the uncooled version. You can figure out focal-ratio via the focal-length since that's not changing. My ST80 is a 400mm focal length. The native aperture is 80mm, so it makes it focal-ratio F5. I want it to be F7 for example, so I can take the 400mm focal length, divide it by 7 and get the new aperture needed, so 400mm/7 = 57mm. So my aperture would be 57mm to generate a F7 focal-ratio on that 400mm focal length ST80. I went with 60mm because it was simply easier to measure and cut. 400mm/60mm = F6.667 so it was close enough for my needs. I targeted something close to F6.5~F7.5 because this puts you at approximately F30 for the Quark to be where it needs to be for bandwidth. For the material, I used a plastic lid, meant for containers and lined the inside lip with felt to match the dew shield of my ST80. I just cut a hole in the middle of course. Thank you again! I will try this focal ratio method and a mask for my telescope in the future. I have ordered a tilt adaptor, and some improvements to my mount and telescope mountings. This solar astronomy is really exciting!!! Sorry for my absence - I was sick then went on Holiday! I tried various 'things', then I found my lunch box does the job! I hope to find the time to keep testing and learning, then I will need to make PST mod [without cutting original tube] and use it with my various scopes.